Ginger root is a rhizome not only great for adding flavour in cooking, it is also an attractive garden plant and easy to grow. Grow it in the garden in warmer climates, or in a container in cooler areas. 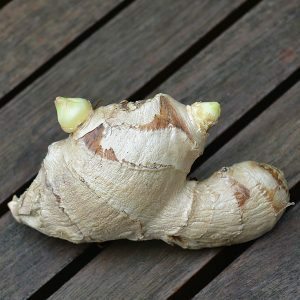 It is the rhizomes that you eat, and you can start growing your own with a piece of ginger that you buy from a market or supermarket. All you need is a large styrofoam box from the green fruit shop. some potting mix, some well rotted compost, blood and bone, and a warm position and you are on your way. In cooler climates, you will need to plant the rhizome in spring once the temperatures get above 12°C. In sub tropical to tropical areas you can grow it almost year round although autumn is usually regarded as best. Basic requirements are simple. You do need good humus rich moist yet free draining soil. Temperatures that do not drop below 10°C. You need a piece of ginger, and store bought ginger will do. Look for a piece that looks like it already had ‘eyes’ developing. You should cut this up into smaller pieces, each with a growing eye. The best time to plant ginger will depend on you climate in cooler areas plant in spring. In tropical climates, plant in autumn. Ginger takes around 6 months to reach a size that is ready for harvest and during this period you do not want very cold temperatures. Use a largish container unless you live in a tropical climate. Try a styrofoam box from the fruit shop. This way its easier to control the micro climate you are trying to create. For growing in containers use a 50% high quality potting mix and 50% well rotted compost. You can mix in a little perlite to improve the drainage. If you are growing ginger in the ground, have a good humus rich fertile soil ready for planting. Mix in some extra well rotted compost. Plant the piece of ginger root around 5 cm deep. Pieces should be planted at around 25 cm apart to allow for good growth. Keep moist throughout the growing season. Mulch around the plant to help maintain moisture. Keep the area free of weeds. Ginger can be harvested in autumn, you can ‘feel’ around in the soil to see how big the ginger has grown. If its not that big you can leave it in the ground in warmer areas. You may need to wait 2 years for the root to develop into a good size, in good conditions you can harvest at the beginning of winter. Ginger can be stored in sherry. The sherry itself will take on the ginger flavour and can be used in many asian dishes. Ginger can also be peeled and frozen. The culinary or ‘edible ginger’ is one of the easier ginger plants at home. It is grown for the rhizome and as this ages the ginger becomes stronger in flavour. The plant you are looking for has the botanical name of Zingiber officinale and is commonly classed as a herb. Grown for the root or rhizome, it is easy to grow in the home garden and will reward you with the freshest tastiest ginger you have ever had. Used widely throughout Asia as well as in many Wester cuisines, ginger is a plant root. The flavour is warm and pungent with a little bit of a warm fiery taste. Ginger (Zingiber officinale) is a rhizome originally form China. Although it can be grown in the home garden it does require a degree of warmth and moisture (equals humidity) to produce good sized rhizomes ready for use in cooking.